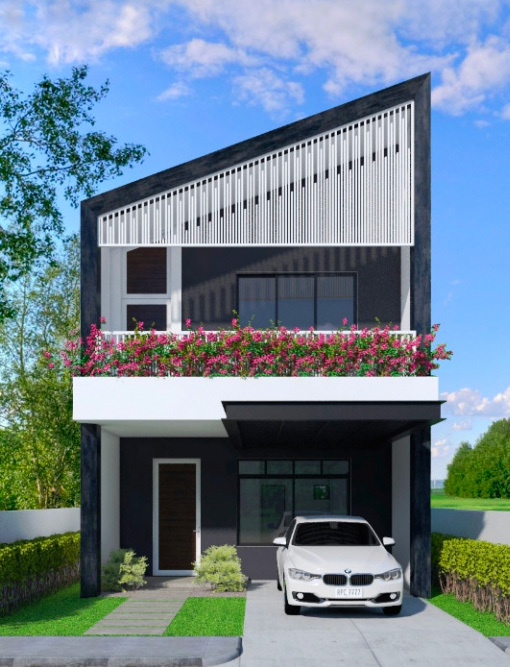 Modern interior design seems to have undergone a mass desaturation process, with many contemporary homes decked out in a monochrome manner. Monochrome is cool, but so is colour. 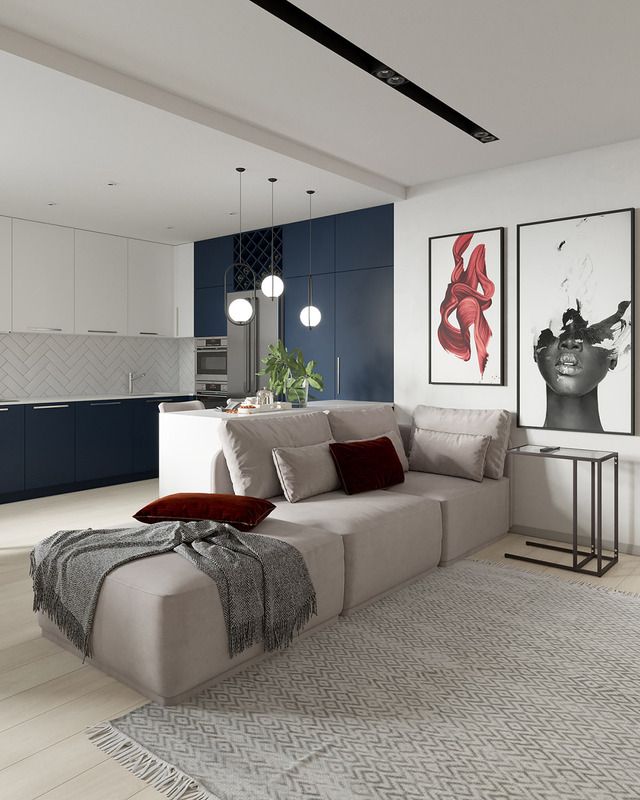 This apartment, visualised by Ekaterina Domracheva, uses chunks of colourful decor, bright art and accent furniture to enliven a smart monochrome base. This combo results in a vibrant space that is easy to live with, one which feels warm and joyous yet relaxing. 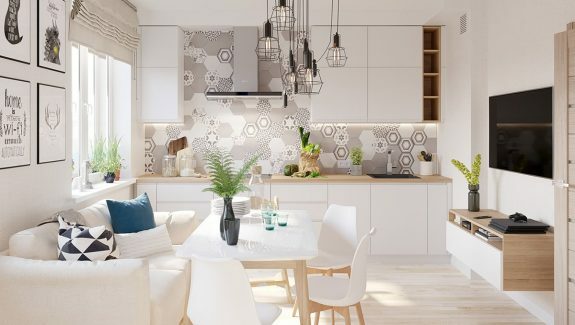 Modern pendant lights, the use of texture and subtle wall pattern add bags of interest to the living spaces too. 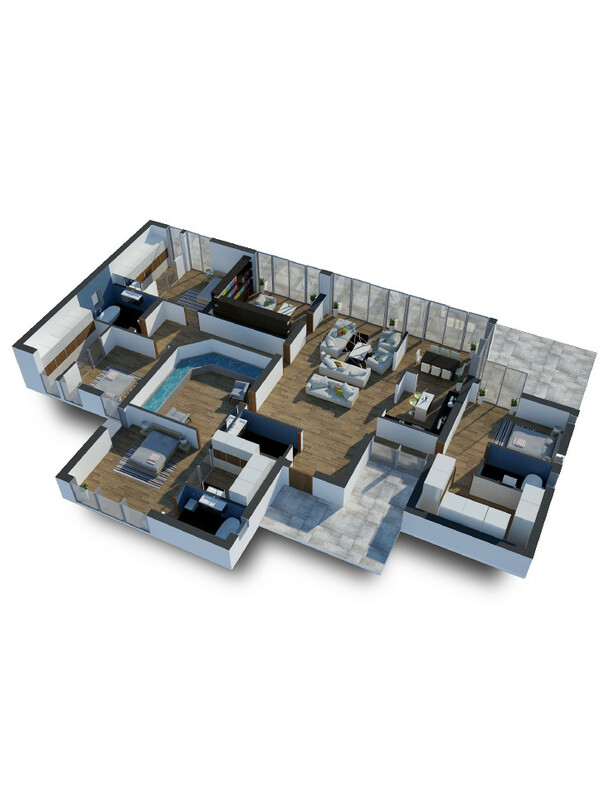 Many of the layouts meet with the challenge of oddly angular room shapes - a challenge that is met with gusto and success. 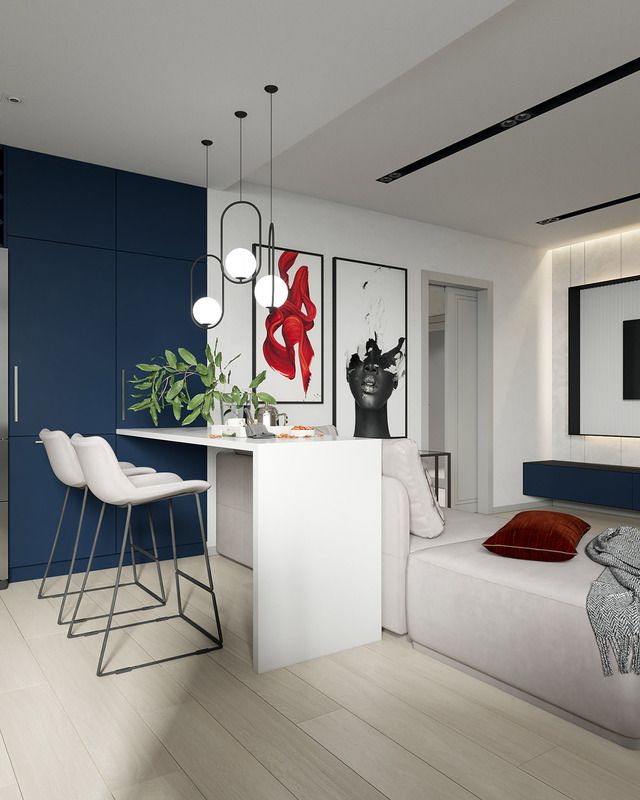 One of the hero pieces in the room is a deep red accent chair, which offers a stylish relaxation spot against the blue tv media cabinets. 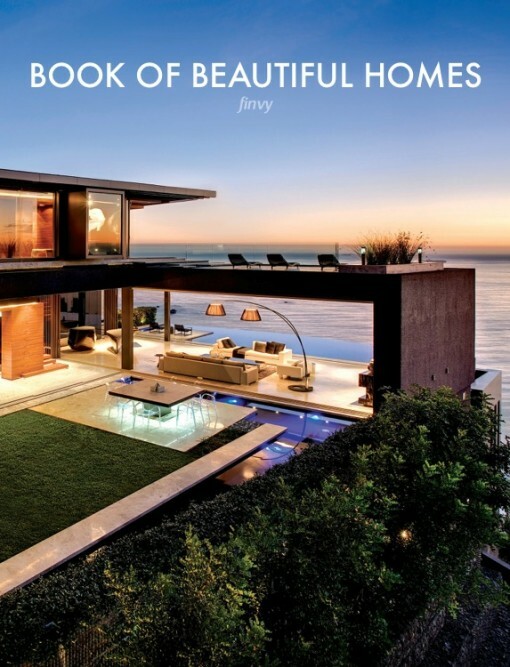 The flat screen tv floats in the centre of a white panel that matches the white walls of the room. Light taupe upholstery covers the modular modern sofa that divides the open plan living room in two. A couple of velvety red cushions brighten the seating. Beside the sofa, a glass side table stands poised and waiting; its stand is shaped to wrap comfortably around the seat base. A beautiful flower basket and shining wine glasses dress a black dining table, where a white table runner cuts across its dark surface. A circular dining room pendant light echoes the round shape of the table. 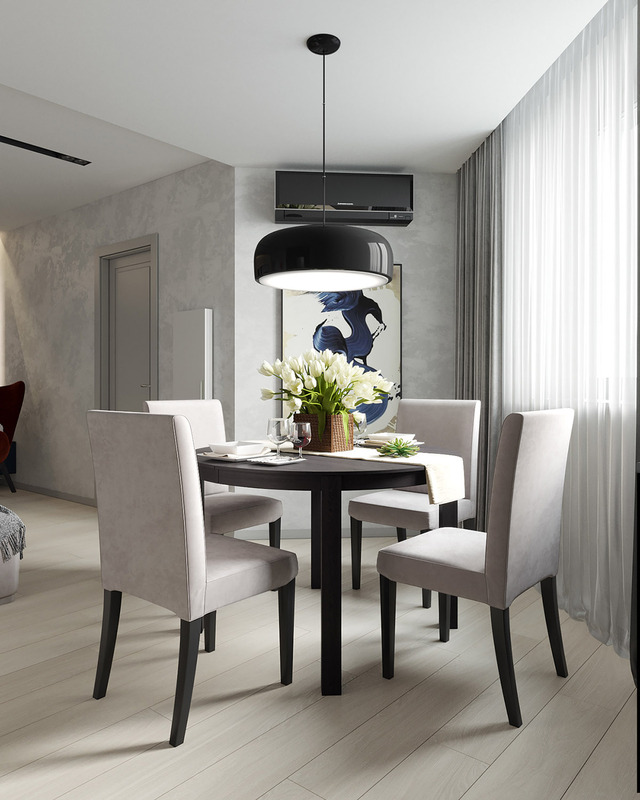 Find more beautiful possibilities for dining room pendant lights here. 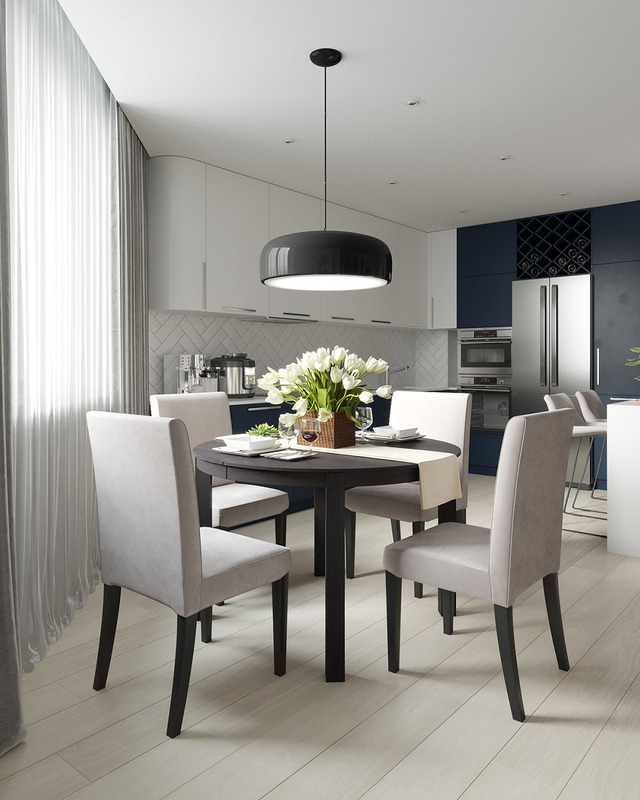 Modern art brings colour to the monochrome dining area. 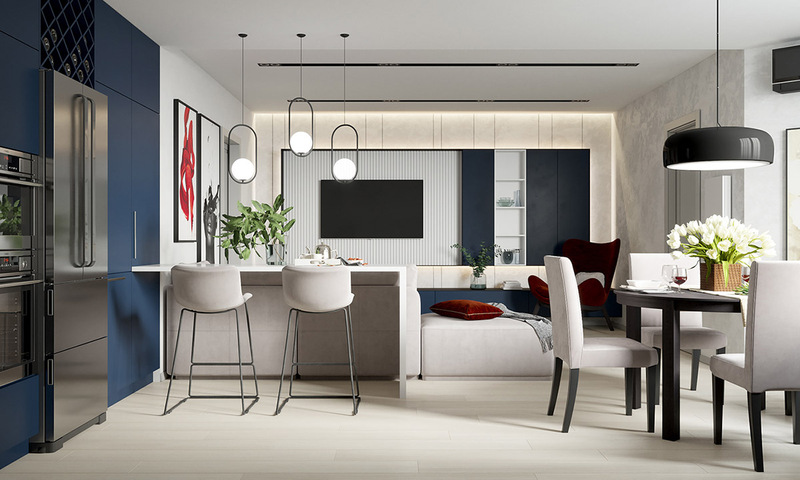 A kitchen peninsula extends behind the living room sofa, set with two bar stools for casual dining and a good view of the tv. 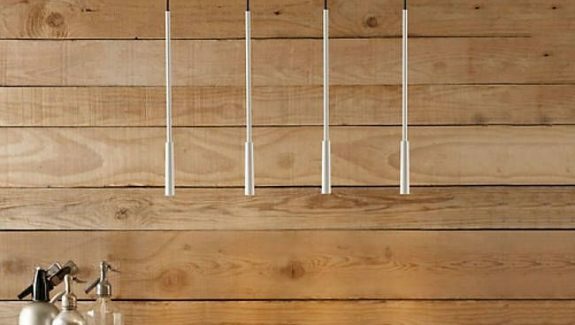 A trio of pendant lights are suspended along the length of the breakfast bar/coffee bar. A vase of greenery decorates its surface. 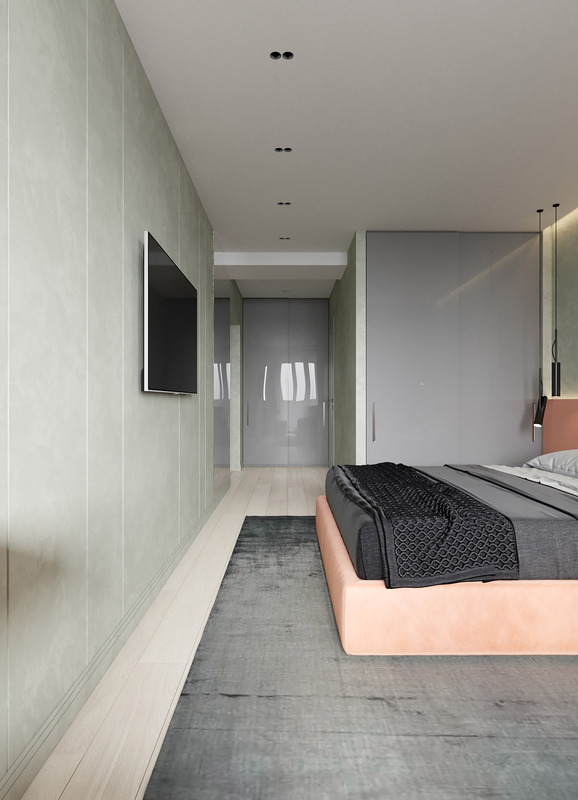 Inside the modern bedroom there is a peach colour scheme at play. 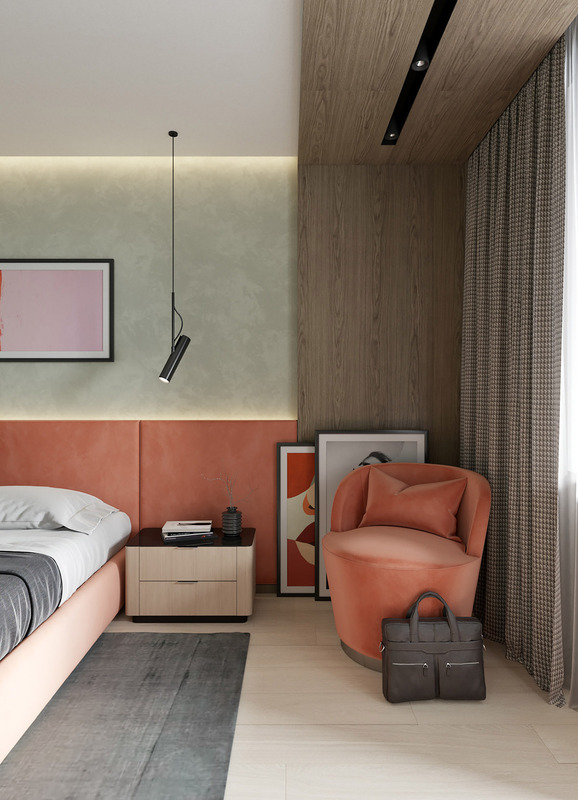 A peach fabric bedstead and oversized headboard dominate the room, matched by the hues in modern wall art. 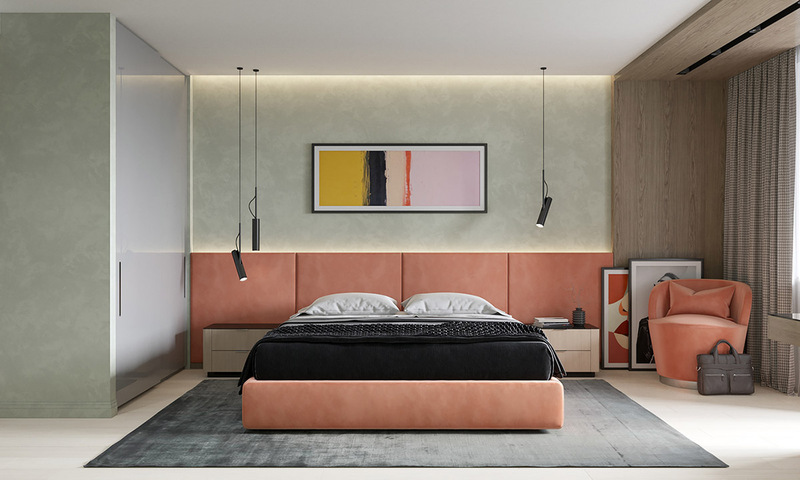 Slender bedroom pendant lights have been picked out in a black finish to offset the sweetness of the peachy palette; black and grey bed clothes contribute to the balance. A peach bedroom chair is set inside a deep wooden window reveal of sorts, with spotlights set into the ceiling panel. 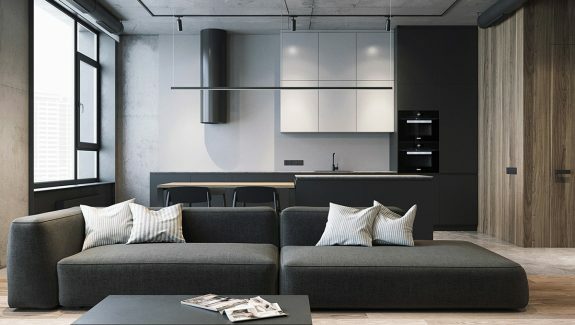 The light wood floor is partially covered by a large grey area rug, which tones with grey closet doors. Over at the makeup vanity area, the wooden window reveal wraps around to encompass an elliptical modern vanity mirror. The makeup storage console has a floating effect, as though it has extruded out of the wall to serve the peach vanity seat. Coral and grey decor covers the master bathroom, in a two-tone tile arrangement. Black base notes punctuate the scheme. 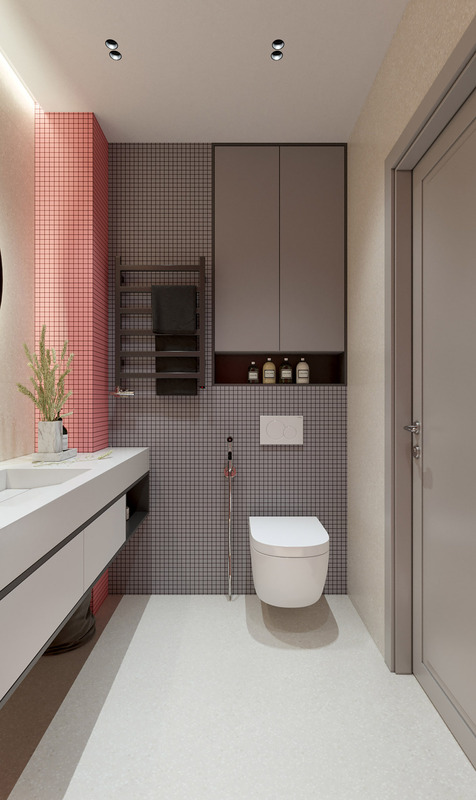 The modern bathroom vanity has a crisp linear design in monochrome. A round illuminated mirror glows above it. 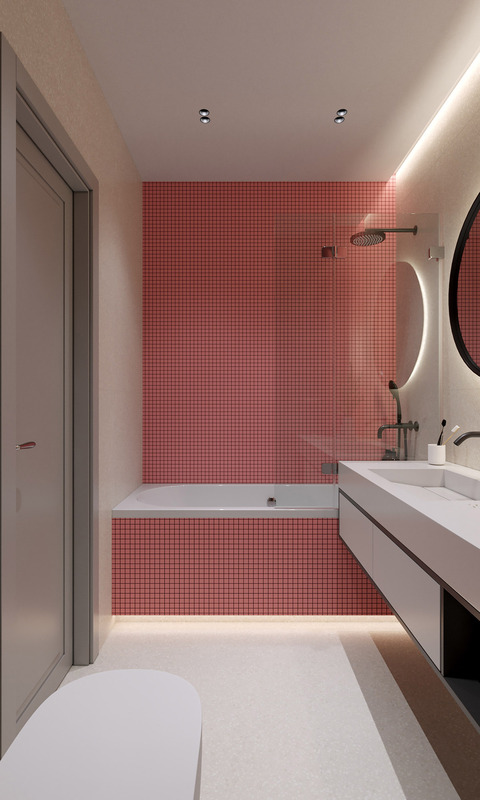 A frameless shower screen shields the splash zone of an over bath shower, allowing pink tiles to shine through uninterrupted. 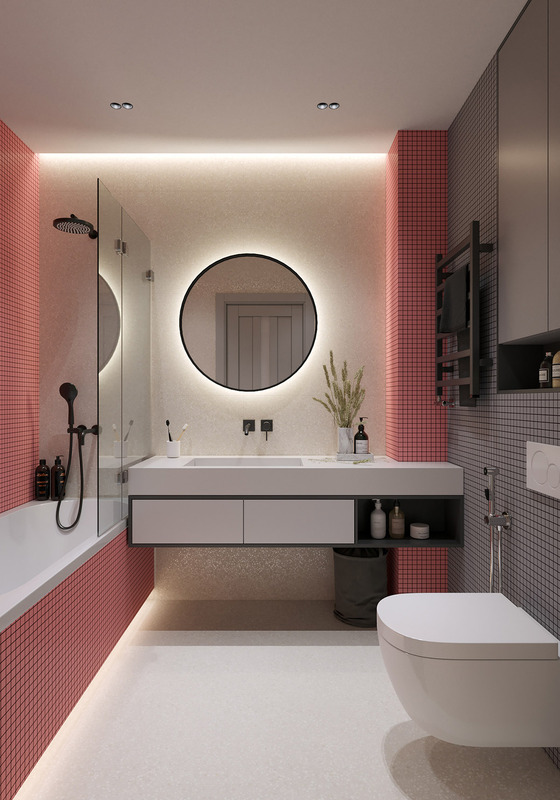 LED lights underline the base of the bathtub, casting illumination over the pale bathroom flooring. 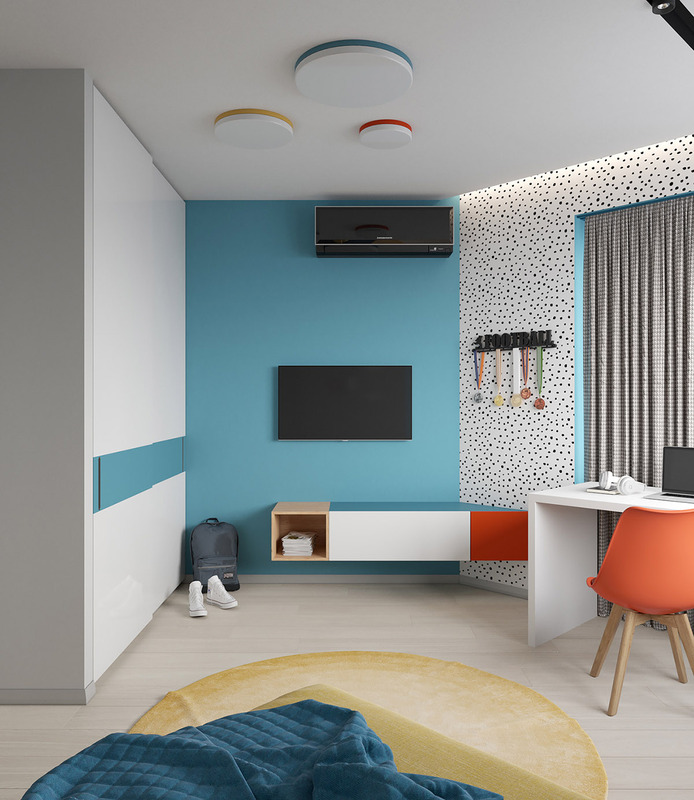 The second bedroom in this home holds a kid’s decor scheme in aqua blue and yellow, and just a pinch of red for added punch. 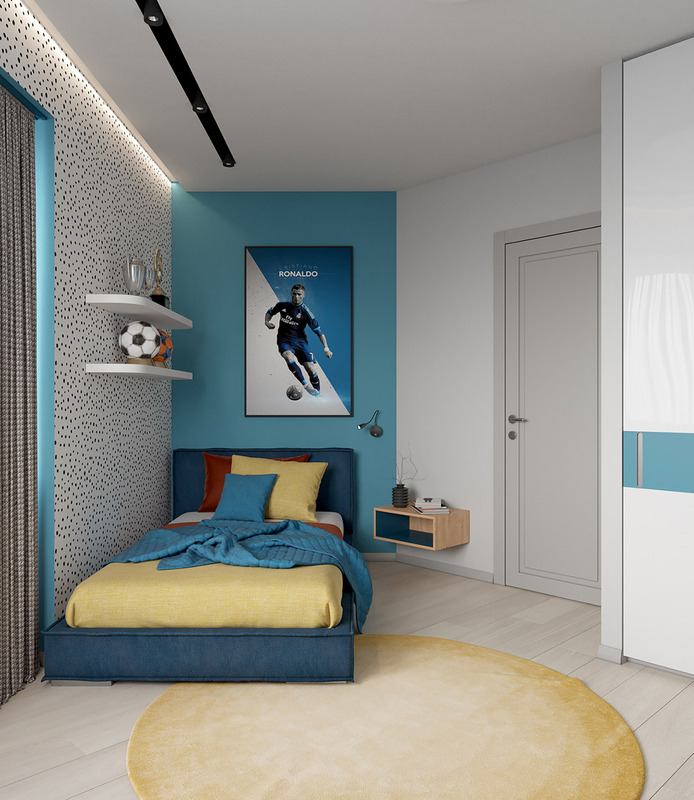 The unusual shape of the room is seen as a design opportunity rather than a hindrance, with the diagonal wall utilised as a good spot for a wall mounted bedside shelf unit. 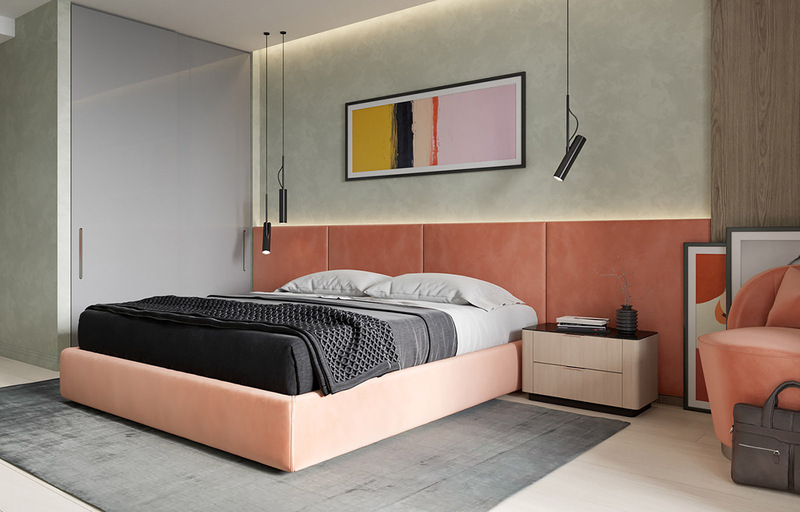 A repositionable wall sconce lights the bedside. 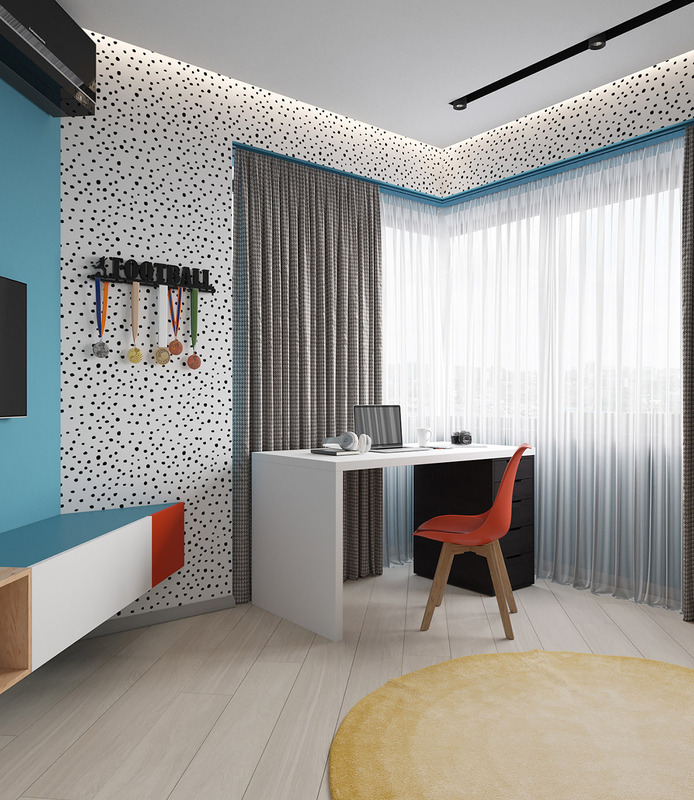 Playful polka dot patterned monochrome wallpaper decorates the other side of the single bed. Two white floating wall shelves display trophies and keepsakes. 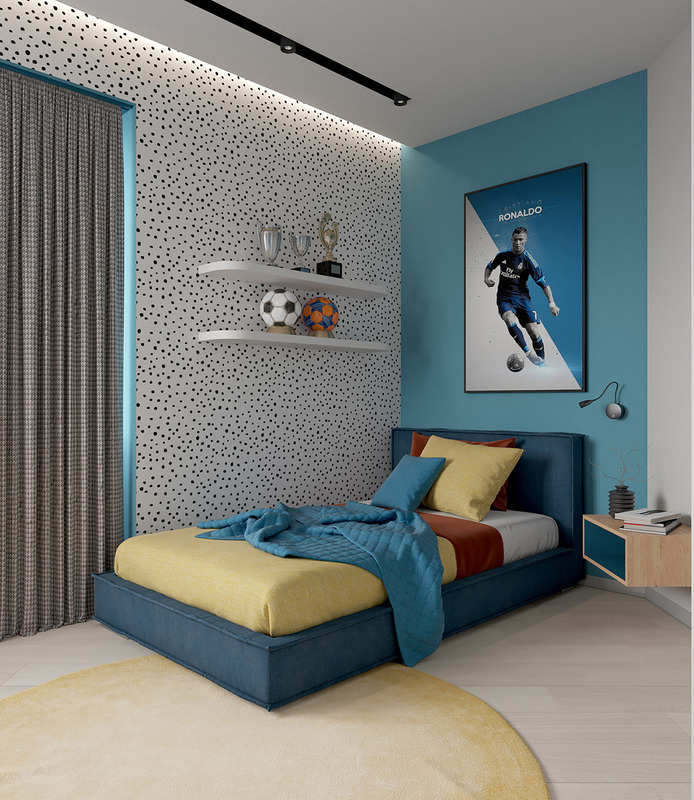 A blue window reveal provides a colourful moment of relief amongst the sea of monochrome wall pattern, and frames black and white drapes. A red desk chair adds another bright accent by the window. 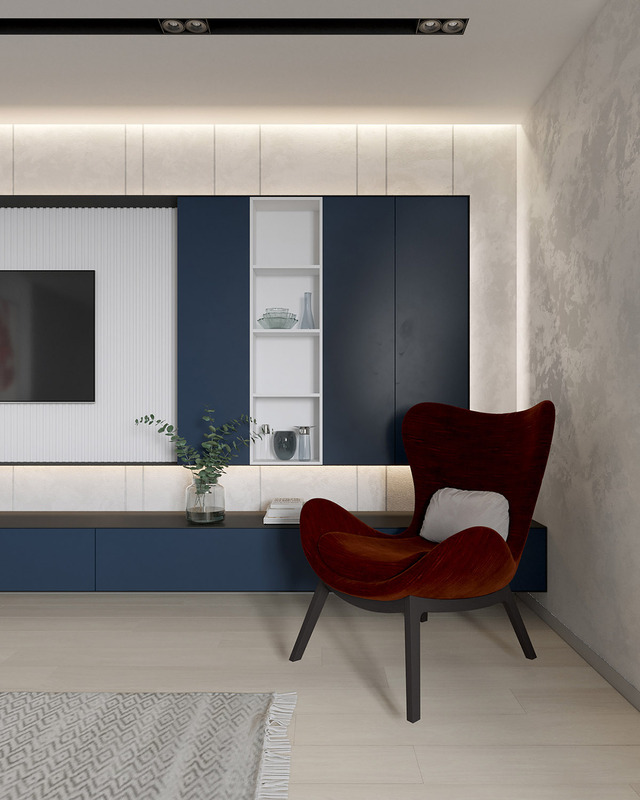 A bespoke tv unit is chamfered to fit the unusual room shape, and its mix and match doors bring the different hues of the room together in one piece. A round yellow rug looks like sunshine on the floor. 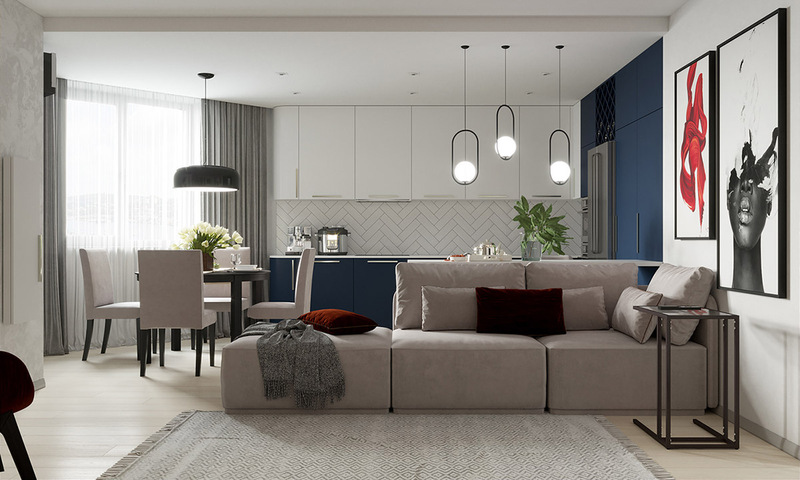 A trio of flush fitting ceiling lights bring a splash of yellow, blue and red to a white ceiling. 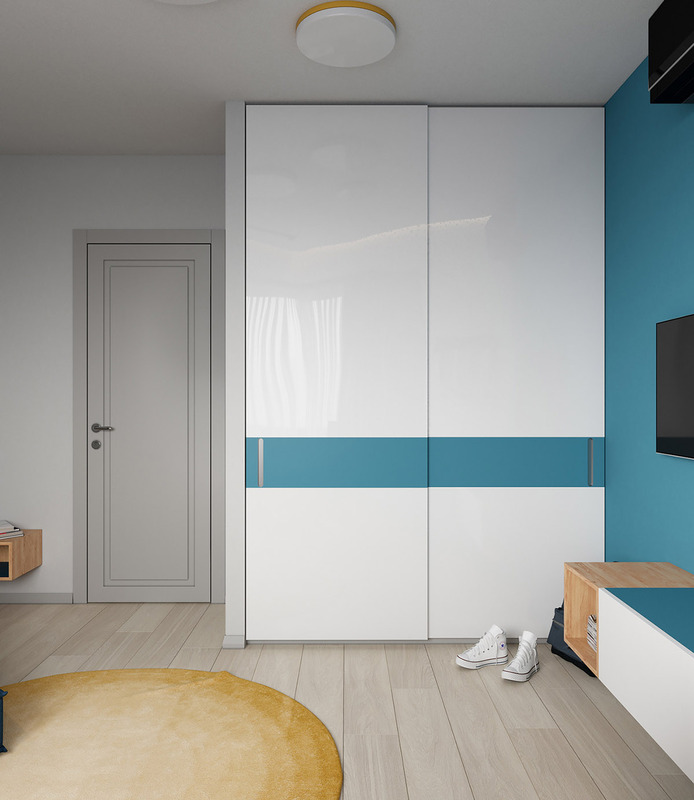 Blue paint picks out the TV wall, and the colour runs on as a stripe across a white wardrobe. 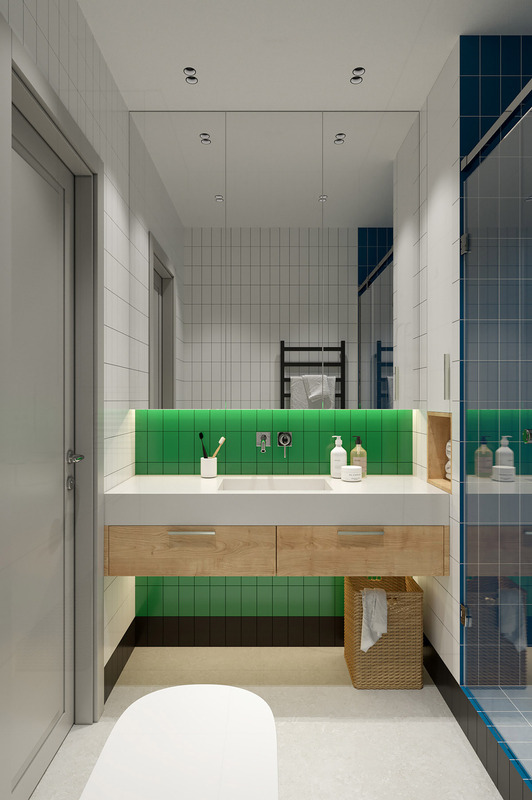 The kid’s bathroom decor is a combination of green, white and blue tiled sections. 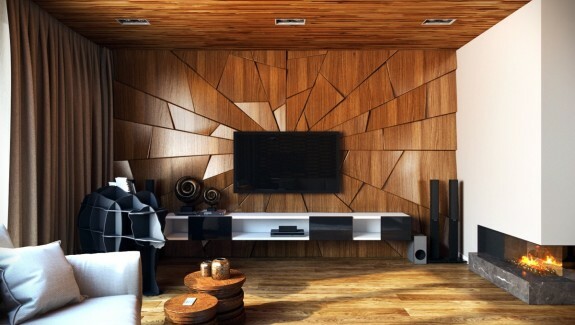 Natural wood tone and wicker accents help to neutralise the lively shades. 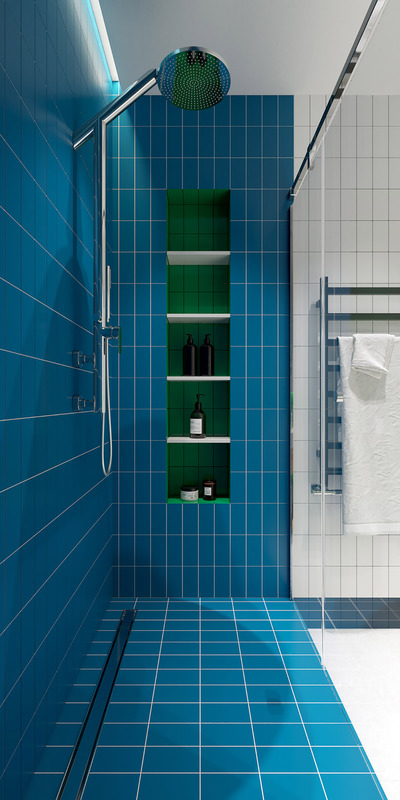 A recessed storage nook in the shower is clad in green tile, whilst blue tiles engulf the rest of the shower enclosure. White shelves cut through the colour, freshening the look. 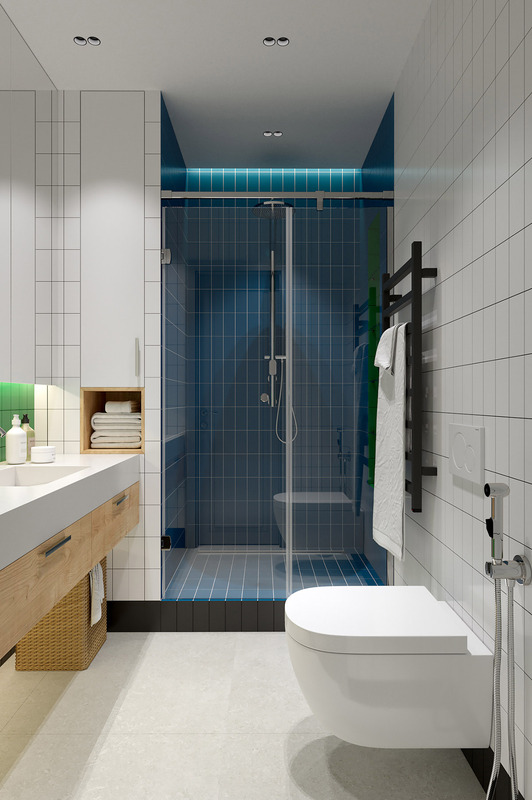 A black heated towel rail contrasts with the white wall beside the shower; black tiles edge the base of the built-in cubicle. A wood lined cubby has been set into the outside shower wall as a handy place to store a folded set of towels. A concealed cupboard above hides away spares and less colour coordinated items.